What are SMBs top business challenges, and how well do mobile solutions help them meet these challenges? Interestingly, that depends on whether you’re asking them about the benefits of having their employees use internal mobile apps, or the value of offering mobile apps and mobile-friendly web sites for external customers, partners and suppliers to use. In every study we do–including this one–attracting new customers and growing revenue top the list of the most significant business challenges that SMBs face. Maintaining profitability and dealing with economic uncertainty also are raised as significant challenges (Figure 1). In this study, we asked SMBs several questions about the kinds of mobile applications they use. We asked them specifically about what mobile apps their employees use for business purposes, and what external mobile apps and/or mobile-friendly web site capabilities they use to interact with customers, suppliers and partners. We also asked them what they think are the top business benefits they get from using both internal and external mobile apps. Interestingly, while SMBs believe that they’re receiving significant business value from both internal and external mobile solutions, the primary benefits they associate with these two categories are quite different. 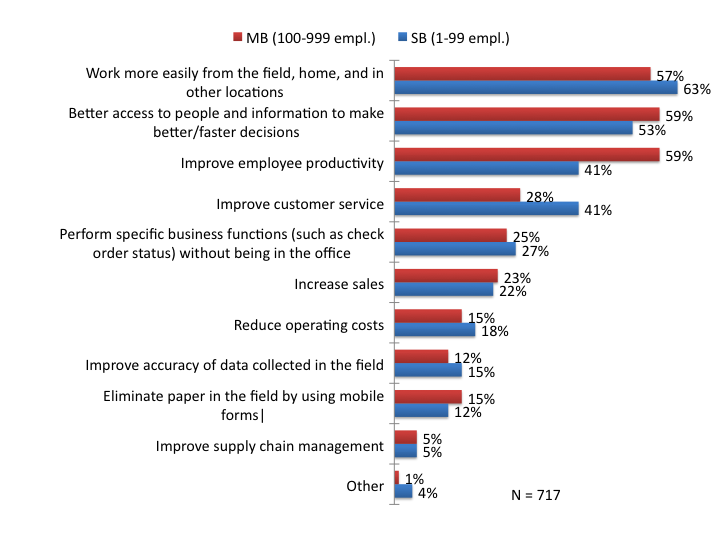 As shown on Figure 2, SMBs associate using internal employee-use apps with things like increasing productivity and getting access to people and information more quickly. Meanwhile, as indicated on Figure 3, they view external applications as a key means to help them grow revenue, attract and retain customers, and keep up with the competition. 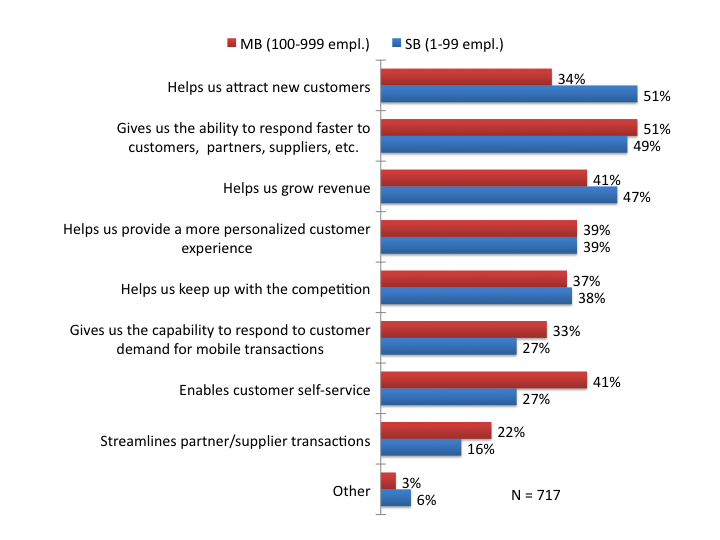 The top benefits that SMBs associate with external mobile apps and mobile-friendly web sites align much more closely to their key business challenges–growing revenues, attracting and retaining customers and increasing profitability. Not surprisingly, this also means that we tend to see somewhat higher demand for the external, customer-facing mobile apps. Some of the areas with the strongest plans to deploy in the next twelve months are applications for external users to: check delivery status of my orders (34%); shop/buy products (31%); and pay for products, goods, or services (29%). However, SMBs clearly perceive significant business benefits from both internal and external mobile applications–and survey results also reveal that SMBs have healthy plans to increase their use and spending for both internal and external mobile apps. As mobile applications proliferate, vendors can best capitalize on this growth with articulate marketing and messaging that helps SMB customers assess which solutions will best meet their needs.